I gave it to my daughter for Valentine’s Day. She LOVES her new “Lenny”. Thank you so much for your help! My 3 year old lost her stuffed lion “Lenny” a couple months ago. She’s had him since before she was born, and he was like a member of the family. He’s in almost as many photos as she is! I found one that was similar, but it was beige and orange. The one she had was beige, with blue embroidery for the face. He was originally purchased at Kmart. I have been looking online for days, and I can’t find anything. I appreciate any help. My daughter tells me every day how much she misses her Lenny! Tammy – Thank you thank you thank you!!!! 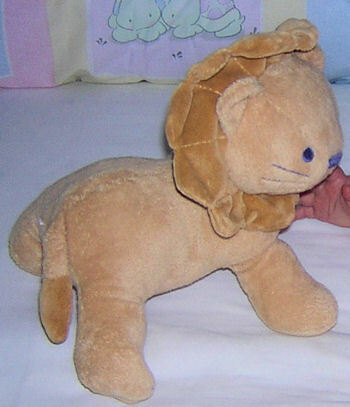 I am also trying to find this lion plush for my 19 month old son. I tried both of the eBay item numbers, but neither one is available anymore. If anyone sees another out there, please let me know. Thank you. You need to Contact Us Desiree. Otherwise there is no way for us to help you.